Customize the imprint for this popcorn box any way you like. An ideal way to get your message or logo noticed! Popcorn box holds 7 cups of popped popcorn. 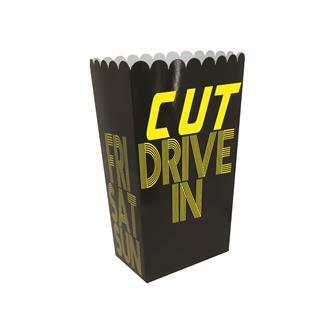 Scoop style popcorn box with scalloped edge, made from 20 pt., high density, white paper board. Liquid laminated for a high gloss finish on front graphic side, uncoated on food side. Popcorn not included. Size : 5 1/2" x 3 1/2" x 9 1/4"